This set of hand-hewn blocks puts the ancient language of the Jewish people at your child's fingertips. 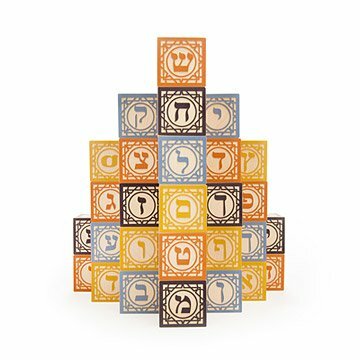 A lovely gift for parents who have a love for language, history, or who consider themselves to be students of culture, this colorful set of 27 hand-hewn blocks puts the ancient language of the Jewish people at their child's fingertips. Also, even if a child's Bar or Bat Mitzvah is years away, it's never too early to get an education on their heritage and the beautiful written language of their people. These lovely cubes are specially made for little hands: letters, numbers and animal prints can be traced easily by tiny fingers, and the blocks' beveled edges make getting a grip on language that much easier. Handcrafted in Michigan of Basswood grown in the Great Lakes area and printed with non-toxic inks. You can clean your blocks lightly with a damp cloth and mild detergent, but avoid getting the embossed sides wet. Moisture is more likely to cling to the crevices, making them more susceptible to damage. This is a beautiful gift that can be passed on and shared with many families. And until the child is old enough to play with them, they make for beautiful nursery decor. I got these blocks for my niece for her 1st birthday. Obsessed. They are great for handling with little hands, learning the hebrew alphabet, stacking! The blocks are beautifullly done and packaged. Wonderful blocks, international to boot! Great fun for toddlers learning and playing, eventually a helpful Hebrew learning tool. Everyone was impressed by these! They were a little smaller than I expected, but still gorgeously made classic blocks. I didn't get to see the actual product because it was a gift for a friend's grandchild but I am told they were delighted with the item I purchased.